Autumn is a great time to plan and begin to develop new garden beds for next year– as though you didn’t have enough to do. 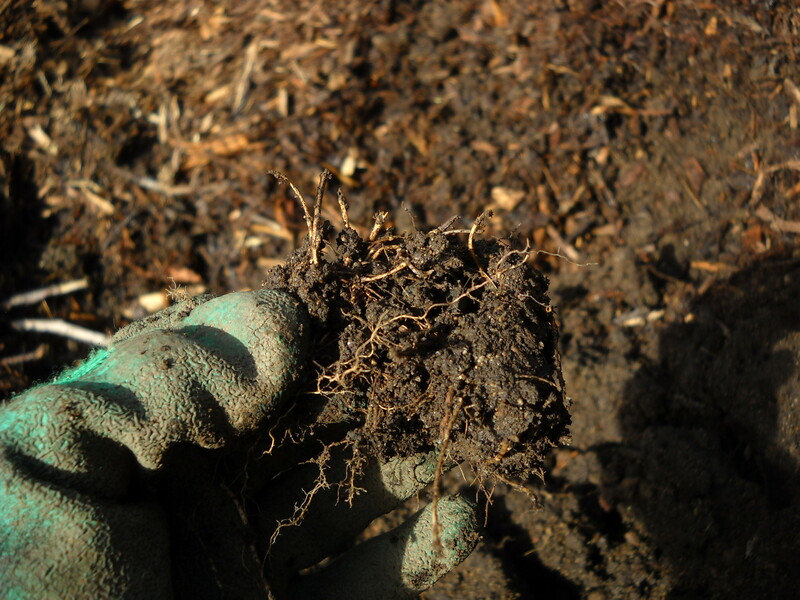 Sheet mulching is the process of layering lots of different compostable materials OVER your grass in order to create a new planting bed without digging up and discarding the turf. And it starts with a heavy layer of newspaper or cardboard (or compost then cardboard, depending on your information source). Then there’s a few inches (more) of home-made or bagged compost or composted manure, then a lot of layers of straw (NOT HAY), leaves (preferably chopped/mowed), yard debris (not with weeds or any leaf diseases like black spot), manure (if you have it and if you can stand it), grass clippings (presuming you don’t already have a mulching mower). To a total of around 18-20″ above the original ground level. Linda Chalker Scott is of the opinion that the layer of paper-product is counter-productive because it prevents/hinders air getting down into the area that you want to compost–the grass turf. 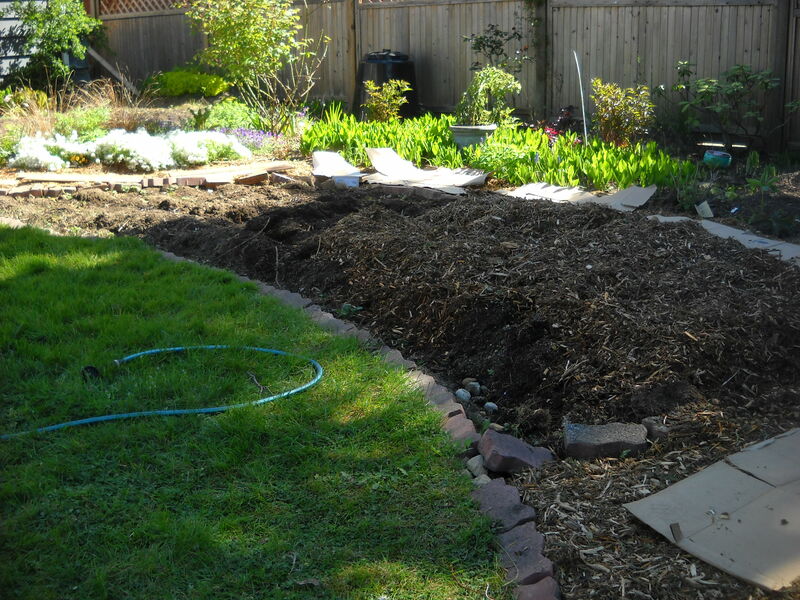 She recommends just covering the area to be transformed with 12″ of woodchip mulch. I’ve tried the sheet mulching thing many times with varying success rates–not least because I don’t have easy access to leaves (almost exclusively conifer neighbourhood), straw, manure, or grass clippings (mine stay on the lawn where they belong). 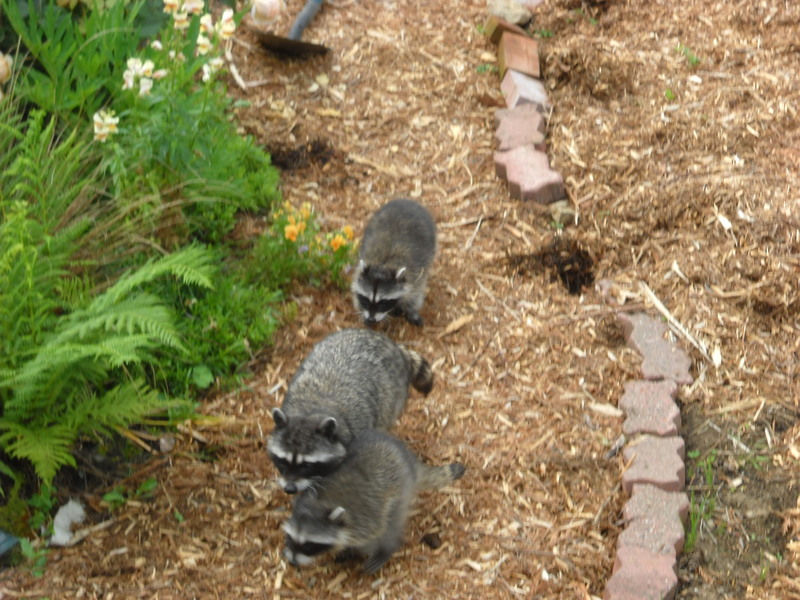 And the racoons love to dig around it, exposing the cardboard to air, and allowing it to dry out. So in general it’s taken two years to turn a grassy area into a planting bed for flowers or vegetables. Not very efficient, but at least I didn’t have to figure out how to dispose of sod (that can’t go into the yard-waste recycling bin). 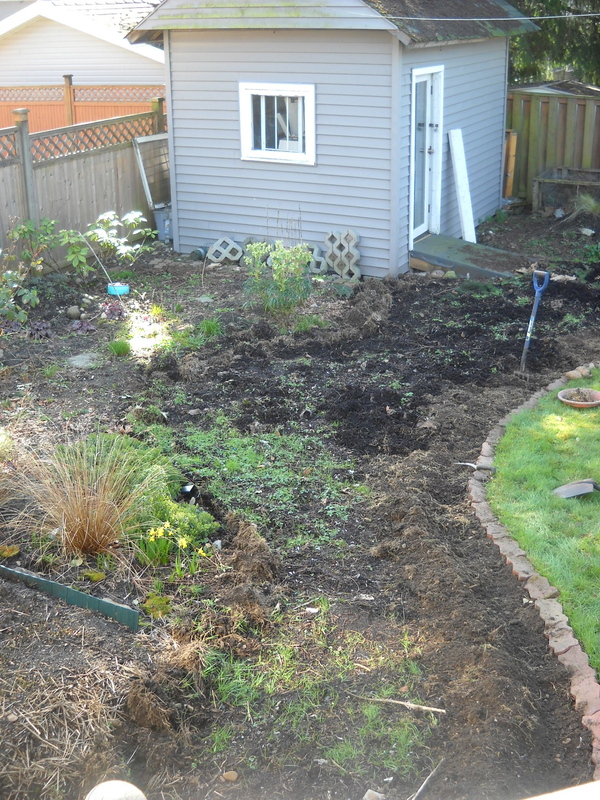 This bed (the area that looks darker and right down to the bottom of the picture) was sheet mulched last fall (2012) with cardboard and 3-4″ of city compost. You can see it was variably effective, with lots of grass and weeds growing through, and not enough composting-in-place of the existing turf. I started in May by digging out the turf in the areas that were to be paths and spreading several inches of mulch. The clumps of turf were placed upside down in other turf areas that were to become planting beds of some kind. So in the picture above, to the left of the brick edging is the path, to the right of the brick edging is a layer of upside-down turf topped with 6″ wood chip mulch. This mountain of wood chips was mostly grass and weeds up until end May 2013. I needed to put the wood chips somewhere, so decided this would be the storage area until used up, and then I’d see how well the underlying plant material had composted. Above you see the storage area of mulch, under which is two layers of up-turned turf bricks (probably about 6-8″ deep) from dug-up pathways, sitting on top of a grassy/weedy area. Through the rest of the spring I continued to use up the mulch on paths through the back and the front, as well as mulching the perennial and mixed beds and borders. The neighbours and their friends did likewise–it was a lot of wood chips! A few dead roots is all the evidence left of layers and layers of turf. 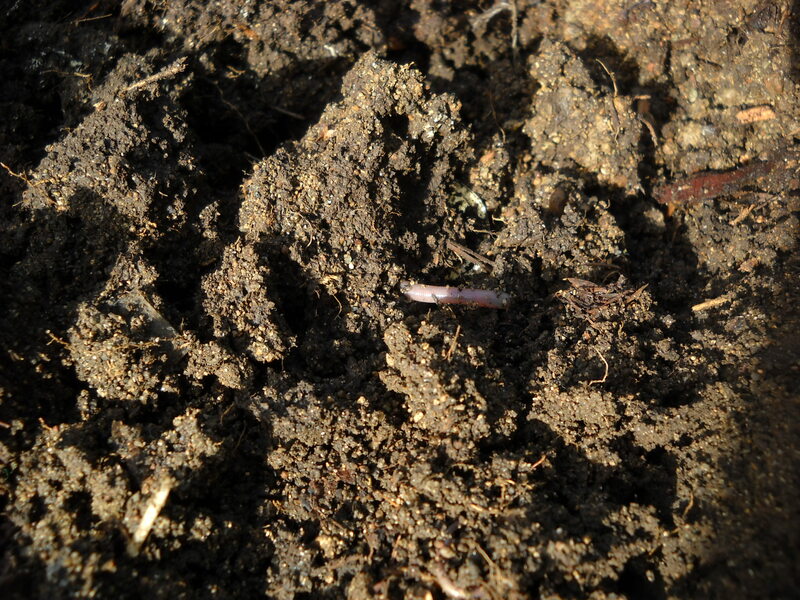 Lovely dark soil, lots of worms. 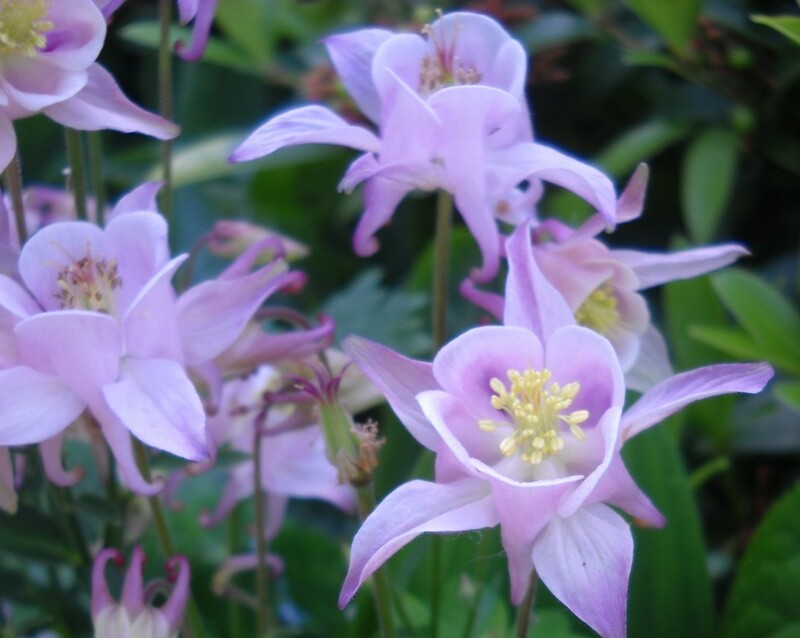 So I’m convinced: Skip the cardboard, skip the manure, skip the grass-clippings–leave them on the grass! Call up your nearest arborist and get them to drop off a truck-load of wood chips. If you can’t use that much, invite your neighbours to read this blog post and then you can all share the bounty! Most importantly, though, the first line in this post: “Autumn is a great time to PLAN…”. don’t leave the garden bed development to chance, or what is most convenient. If you can’t quite figure out where you want to develop new planting beds, ask a neighbour or friend whose garden you admire. They’ll be sure to want to help you! Gardeners love to share their hard-won wisdom! Comments? Questions? Love to hear it all. Don’t forget to click the “follow” link and the “like” button. Again, I defer to Linda Chalker-Scott: The Myth of Pretty Mulch pretty much 😉 says it all. Using bark mulch has too many disadvantages, whereas wood chips have few. Lasagna treatment–layering cardboard and then compost over the grass and waiting for the whole lot to compost down to nice rich soil. Unfortunately not enough layers resulted in grass growing through after a nice mild wet winter. About 6″ of wood chip mulch applied on top of the turned-over, partly-decomposed turf. Of course, it’ll be few hours more work to fill it up. As I’ve said in previous posts, my garden is my research field. So I’m going to try to plant vegetables into this area at the end of the month, when the nights will be warm enough to allow the heat-loving plants to finally get out of the house. I’ll keep you posted on how we’re doing. Incidentally, take a look at how the morning sun GLOWS through the leaves of the lily-of-the-valley. (Click on any pictures for a larger view.) Stay tuned for a post on “making the most of morning and evening light”. Very quick post here. Having received a driveway-load of wood chips from a local tree service, and knowing that it’s largely of the cedar-Thuja-Douglas-fir variety, I googled to find out if it was safe to use as garden mulch now, or should I pile it up in an enormous mountain in the backyard waiting for a year of composting. Bottom line seems to be: make sure the soil and plants are moist, put down fresh chipped/shredded mulch, and don’t worry about the acids, the oils, the nitrogen deficiency, the manganese build-up that others have warned against. I’m going to continue this “research”, particularly to see what it says about wood chips vs bark mulch. Stay tuned, and comment with your own experiences or questions.